Writing memes offer a fun break and a good laugh for hard working writers. Most of them use images frequently shared on social media with white bold text. The text focuses on common writing themes, grammar errors, writer's block, procrastination and more. The most common writing meme is probably the "You Should be Writing" meme. These feature images with text indicating that a writer should be writing and not messing around on social media or otherwise procrastinating. 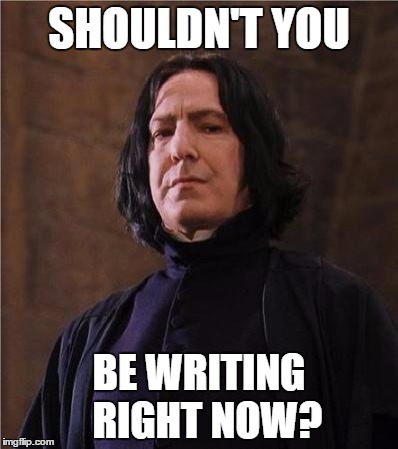 The one below features Professor Severus Snape and the words, "Shouldn't you be writing right now?" Another one has an image of Darth Vader and says, "I find your lack of writing disturbing." You can find many more examples of this meme here on Google Images. Another frequently used writing memes start with "Hey girl" and feature encouraging text and images of actor Ryan Gosling. This is a common meme used for many different subjects. You can find a bunch of them here on Google Images. People also like to share a typing GIF alongside text on social media Some commonly shared typing GIFs feature Kermit, cats and Jim Carrey. You can find typing GIFs like the one below on Giphy. You can find other types of writing memes here on Google Images. You can also find writing memes on Pinterest and Tumblr. A great resource to learn more about memes and how they started is the Know Your Meme site. You can add to the writing meme culture by making your own memes using tools like the Meme Generator on Imgflip. Grammar Memes: Another common writing-related meme is the grammar meme. The most frequently used are the Grammar Police and Grammar Nazi memes. You might be sent an image of one of these characters if you have been correcting other people's grammar on Twitter. Procrastination Meme: This meme pokes fun at how easy it for writers to get distracted and put off the writing of a paper or novel. Writer's Block Meme: Writer's block is another writing meme shared on social media. The unwelcomed creativity block is frequently discussed by writers. As a result it is often represented by comics, graphic memes and pithy sayings. Reading and Book Memes: Find out about the love of reading book meme, too busy reading meme, reading Gifs and more. Coffee Memes: There are many coffee-related memes covering coffee need, morning coffee, strong coffee, being out of coffee and more. Keyboard Warriors and Rage Typing: You have probably encountered keyboard warriors online. They are ultra passionate about a subject and are prone to using all caps. If you find you are spending way too much of your day creating and sharing fun writing memes you might want to try a writing prompt or poetry prompt to get yourself writing again.